If you have any old photographs relating to the John Paul Jones Museum, we would love to hear from you. Email us at: heritagescoiety@kirkbean.org. 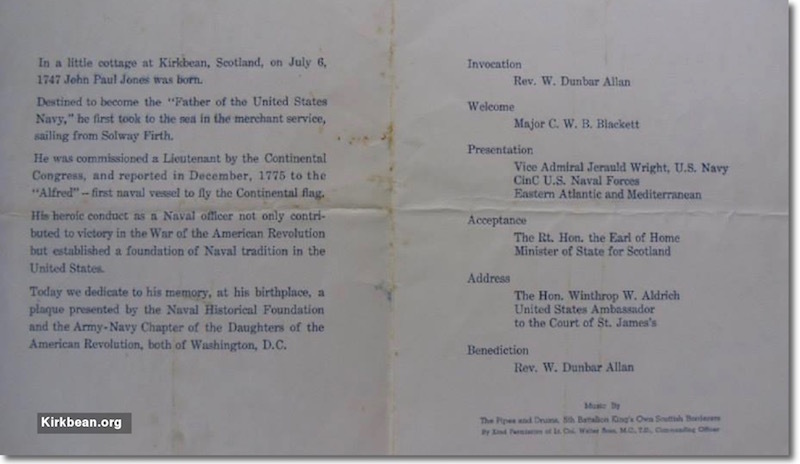 The dedication of a memorial plaque to John Paul Jones, father of the United States Navy, took plate at the cottage where he was born, now a museum to him, on the Arbigland Estate near Kirkbean on July 30th, 1953. The event was attended by Vice Admiral Jerauld Wright of the U.S. Navy, The Hon. Winthrop Aldrich, U.S. Ambassador to Britain and The Secretary of State for Scotland. The invocation was given by Rev. W Dunbar Allan. This is an original programme marking the event. Kirkbean.org is the official website of the community of Kirkbean, Dumfries & Galloway, Scotland. © Copyright Information: Images tagged with ‘kirkbean.org’ may be used on condition that these are credited to ‘kirkbean.org’. Text: May be reproduced provided a credit is given to kirkbean.org or, where stated, to any other copyright holders where information has been reproduced under the Creative Commons Attribution - Share-alike License. The Kirkbean Logo is copyright and may not be used without the written permission of Kirkbean.org.